We've been working on some small updates in our downstairs full bath (basically the master bath). It's definitely the worst bathroom in the house and at one point we entertained the idea of gutting it before the baby got here but decided to hold off since we really couldn't figure out a good configuration. Instead, we're trying to make it better with what we have and one of the many issues that we have is the white laminate base. I saw a tutorial online that used pre-colored enamel to paint the laminate and so I decided for $10 it was worth trying it out. Pretty much right off the bat it was horrible. The color was about 10 shades lighter than what was on the can and it didn't go on smoothly or evenly. I figured it must get better with additional coats so I painted out the whole thing (which was a mistake) and let it dry for a couple of days. After it was completely dry, I tried to put on a second coat but I noticed it was taking off the bottom coat. After a little scrubbing, the enamel came off leaving the vanity looking exactly like it did before (the first door in the first pic is pre-enamel and the same door in the second pic is after I scrubbed the enamel off). At this point I called it a fail and spent 45 min scrubbing the whole vanity back to where it was a couple of days prior. So what went wrong? Well, I didn't pay full attention to the tutorial and I purchased water-based enamel versus oil-based. 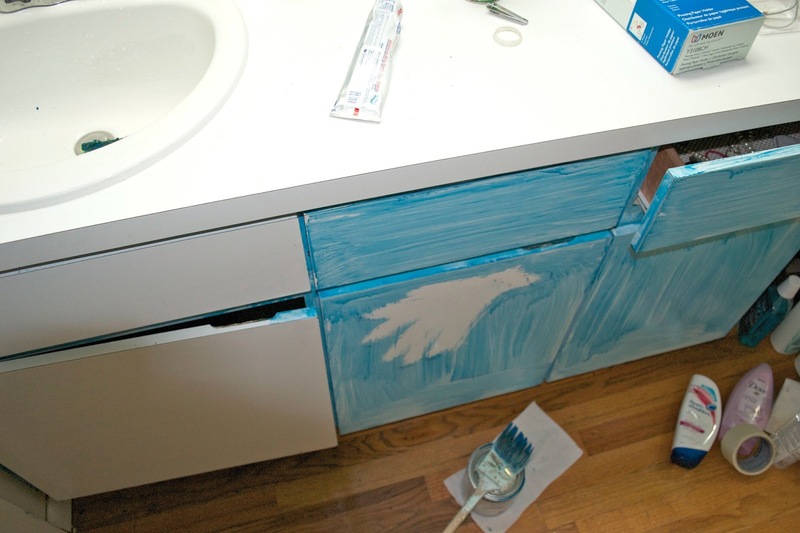 Honestly, after the horrible performance of the water-based enamel, I don't have high hopes for the oil-based but we're going to give it a try (on only one door front this time) and see if we can get some color in this bathroom! all that work to have it wash off...frustrating. 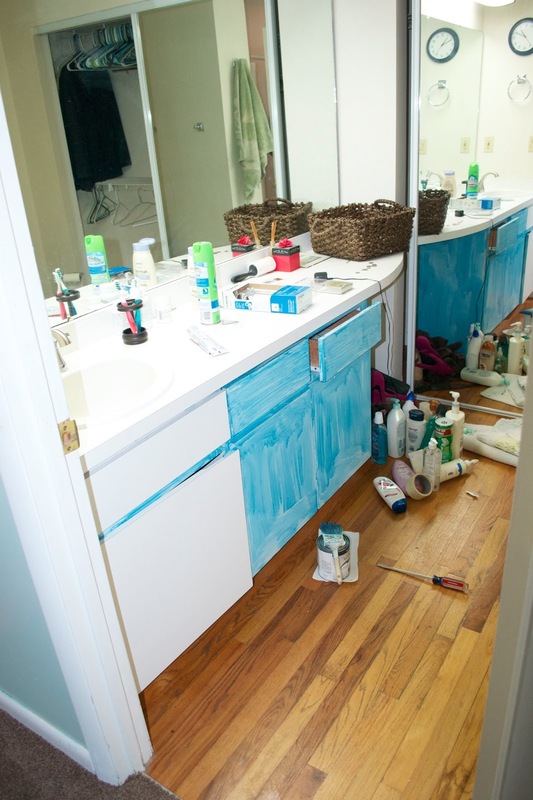 I guess instead of painting the cabinets...you could add a colorful rug and one of those snazzy frames that go around the mirror and some colorful accents?? Just a thought. Hope the oil based is better.